Before taking early retirement a couple of years ago, I spent 34 years doing accounting and finance work. I grew up fully sighted and relied on good vision for my intensely-detailed work, spending long hours staring at numbers and other data on a computer screen. Then, in my early 50s, the effects of my progressive eye disease, degenerative myopia, began to become more apparent. I struggled for a few more years with the aid of software which magnified and reversed the contrast on my monitors so I could make out what was in front of me. Managing tasks at home also became increasingly problematic. I gradually lost the once taken-for-granted ability to read text on paper, see when I filled up a cup of coffee, or determine which belt was black and which was navy blue. 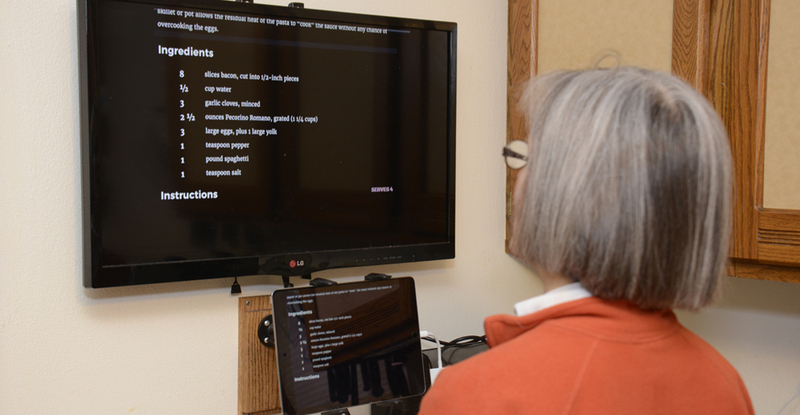 In early 2013, I learned about our local assistive technology organization, MonTECH. They support those with disabilities of all kinds, and they have a technology demonstration lab here in Missoula. I made multiple visits and began to consider whether a CCTV might address some of my biggest challenges. However, a few things held me back from making the purchase. One was the fast-evolving state of the technology. Another was the unknown progression of my vision loss and how my needs might change over time. Finally, the most richly-featured models were expensive. Acquiring a setup with OCR (optical character recognition) was very appealing. It could read text to me as well as provide visual enhancement. But would my vision actually deteriorate enough to make OCR capability a good investment? While the newest models were becoming more portable, they still seemed bulky. Then a model came along that incorporated an Android tablet, and an idea was born. Rather than purchasing a CCTV, I decided to try to make one using a tablet and a monitor. For “proof of concept,” I started with an old Android tablet. With the help of my husband, I procured a couple of different mounts and a large flat-screen display. Since I really like to cook and reading cookbooks was becoming almost impossible, we set up the flat screen monitor in the kitchen. We attached one of the mounts to the wall and connected the tablet and monitor. I opened the camera app and positioned a cookbook under the tablet. The page displayed on the screen. It worked! Since then, I’ve swapped out the Android for an iPad Air II and a specialized connector between the iPad and the display. I also added KNFB Reader to the iPad. All in all, I spent somewhere between $600 and $700. Far less than I would have spent for a proprietary CCTV. While I’m using visual enhancements and a tablet for the camera, this setup could just as easily be implemented with a smartphone. And, since I created my system, the Seeing AI app has come to iOS as an alternative to KNFB Reader. This is a free app which can further reduce the cost of this setup. This setup works for me because it meets both my current and expected future needs. The camera will magnify an item and it’s further enlarged when displayed on the monitor. I can adjust or reverse contrast with the “invert colors” option in the Accessibility settings. My desire for OCR is met with VoiceOver and KNFB Reader. I can have it read my mail, display a recipe on a large screen or magnify the tiny print on a medication bottle. I’ve also re-purchased several of my favorite cookbooks in Kindle format so I can display pages directly onto the monitor. Putting these technologies together in this way is not a “push button” solution and isn’t for everyone. It is cost-effective and very functional for those with a certain comfort level with technology. To illustrate how my system works, my husband and I created this YouTube video. It shows both a setup with a portable mounting bracket as well as the fixed mount in our kitchen. My hope is that by showing how off-the-shelf, conventional technology can be combined into a cost-effective assistive solution, it will encourage more “out of the box” thinking. Thinking that can lead to expanded options for those dealing with visual impairment. Sara Streeter is a retired accountant living in Missoula, Montana with her husband Jim. She heard about our opportunity to be a guest blogger for Second Opinions from Diane Gray at Montana Blind and Low Vision Services through our Making Sense newsletter. We think she has a great idea and we thank her for sharing her ingenuity! This was really interesting. What great ingenuity!